In the previous post the TI TMS/SBP9900 was covered, as well as its successor the SBP9989. The 9989 was to be replaced by the 9989E, a 50% shrink to 2.2u. This was never released, but TI did continue to develop the bipolar line of the 9900s. After canceling (or perhaps just renaming?) the 9989E/9990 TI announced the SBR9000 in 1985. The SBR9000 was a hi-speed 9989 successor fab’d on a 2 micron I2L process and clocked at 9MHz (twice the speed of the 9989). The change in prefix from SBP to SBR hints at another feature, while the SBP9989 was a MIL-STD-883 rated part, the SBR9000 (and its peripherals) were designed for very high radiation tolerance. The SBR9000 was spec’d to have a total dose tolerance of 1 MegaRad (it should be noted that around 10 krads proves fatal to the average person). The part number of this example, RAY9000C-X is a bit mysterious but there are some strong clues as to its being a prototype of the canceled SBR9000. First of course is the 64-pin CDIP package, conveniently having 4 ground pins marked. Pins 1,2,27 and 28 are the ground pins on all SBP9900/9989 devices. The SBR was to be pin compatible so has the same ground pins. The date on the back of the RAY9000 is 8525, the SBP9900 was out of production in 1983 so that rules it out, leaving either a 9989, or the most likely, a sample of a SBR9000. Why TI canceled the SBR9000 remains a mystery, perhaps they found the 9989 to be adequate for their customers needs, as it continued to be produced into the 1990’s. 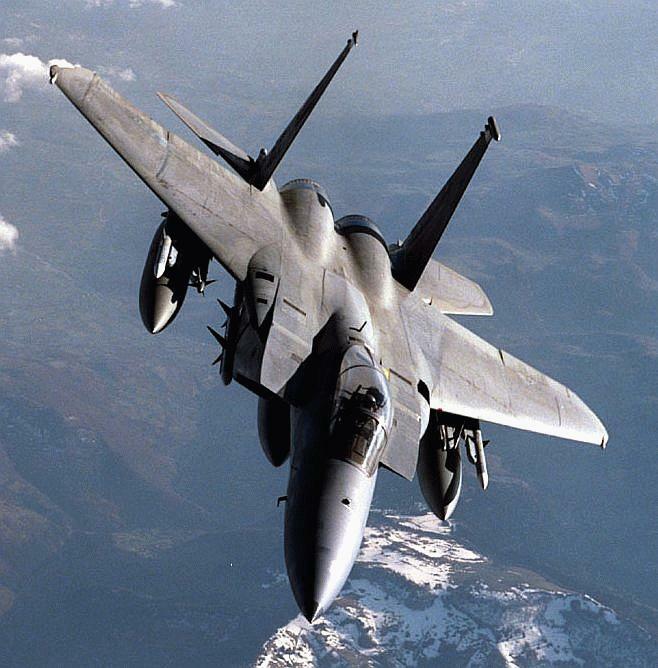 In 1980 the United States Air Force published a standard for a 16-bit Instruction Set Architecture (ISA) to meet their needs for computers on fighters etc. This standard is known as MIL-STD-1750A and laid out what the processor needed to be able to do, but not how, or what would be used to accomplish it. This allowed manufacturers to implement the standard in anyway they wanted. It could be done in CMOS, Bipolar, SoS, GaAs or even ECL. It was designed (like the Signetics 8X300 and the Ferranti F100) with real time processing in mind, similar to what we would call a DSP today. Many companies made 1750A compatible processors including Honeywell, Performance Semiconductor (now Pyramid), Bendix (Allied), Fairchild, McDonnell Douglas, and others. The processors ended up finding uses in many things outside of the USAF, including many satellites and spacecraft including the Mars Global Surveyor. The standard was not restricted to military use, in fact commercializing it was encouraged, as this would increase production, which would help decrease costs for the military. Fairchild designed the F9450 to meet both the commercial, and military markets. Initial availability was in 1985 and the F9450 provides an on-board floating point unit, an optional, second chip, on other implementations. Fairchild also made a F9451 MMU (Memory Management Unit), and a F9452 BPU (Block Protection Unit). The 9450 was manufactured in a bipolar process (Fairchild called it I3L for Isoplanar Integrated Injection Logic). This helped boost speed, as well as greatly increased reliability, as bipolar is much less susceptible to higher radiation levels then CMOS is. 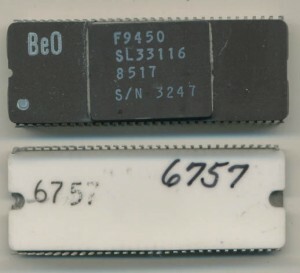 Bipolar processes also generate heat, lots of it and to help counter this Fairchild used a somewhat unusual (for a processor) ceramic package made of Beryllium Oxide (BeO). BeO has a higher thermal conductivity than any other non-metal except diamond, and actually exceeds that of some metals. Normally the ceramic on a CPU package is some form of Alumina (Al2O3). Beryllium itself is a carcinogen so grinding, or acid application on BeO is not recommended. The bottom of the the 9450 was made with a different ceramic, as the goal was to get the heat away from the chip, and not back into the PCB. 9450s were available in speeds of 10, 15 and 20MHz and in Commercial, or Military temperature rating. MIL-STD-883 screening was of course available. By 1996 the 1750A architecture was declared inactive and not recommended for new designs. However, due to its extensive software support, reliability, and familiarity, it enjoys continued use, and is still being manufactured by several companies. Intel who we know as a CPU company, actually got its start, and most of its revenue, by making EPROM’s (Electrically Programmable Read Only Memory). EPROM’s were actually Intel’s most profitable product line through 1985. 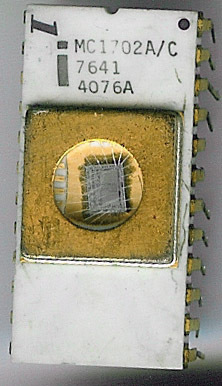 The 1702A was introduced in late 1972, it holds all of 256bytes. (2048 bits). This particular device is MIL-STD-883 Class C compliant (Class C no longer is used today). It had to undergo much more testing and process control then a regular commercial device, as well as work in higher/lower temperatures. This particular part was made in late 1976. Sadly it has a couple missing pins, but for being 32 years old is not bad.